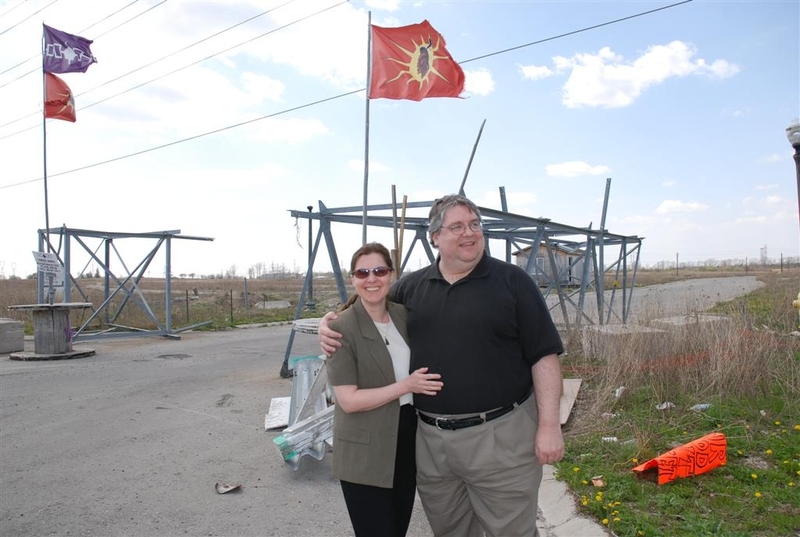 UPDATED 1817 April 22/10 — Today, the Crown dropped the charge of Counselling Mischief Not Committed against Gary McHale — nearly two and a half years after a pretrial judge told the Attorney General not to bring the case to trial. 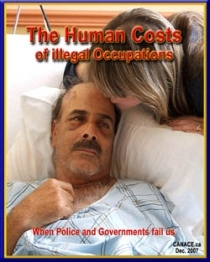 In my last post I outlined some very powerful reasons why the Crown might want to take such an action, including the fact that two of Fantino’s most senior officers have already faced Obstructing Justice charges because of the disclosure given to McHale, and the fact that the Superior Court could very well order the former Deputy Minister of Community Safety and Correctional Services to turn over her emails to McHale. I suppose the Crown and government finally realized that McHale already had enough evidence to use in private prosecutions against his persecutors, and that providing even more to open a door into the Minister’s office wasn’t such a good idea. 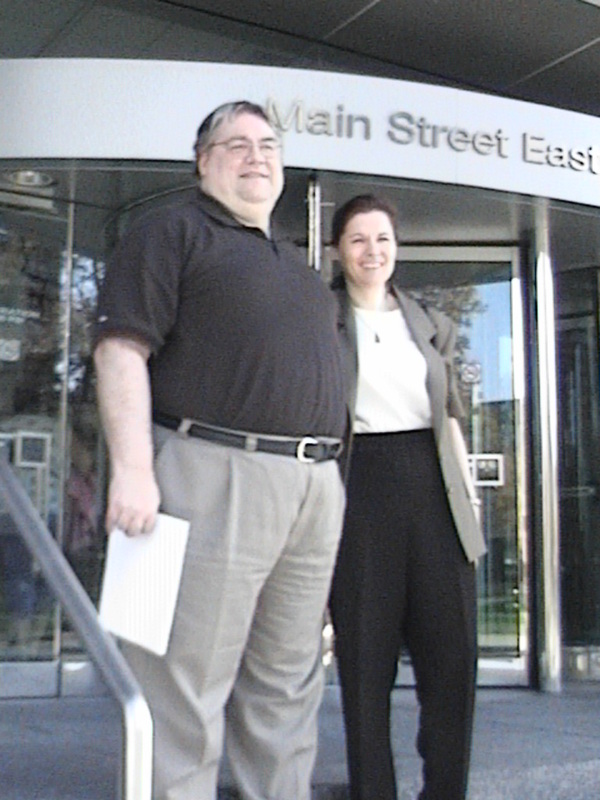 Photo above: Gary & Christine McHale stand on John Sopinka Courthouse steps in Hamilton after charge of Counselling Mischief Not Committed dropped; by Mark Vandermaas, April 21/10. The Crown read a prepared statement into the record that stated it still believed it could obtain a conviction, but thought it better not to waste Court time due to the “unique circumstances” of the case. McHale then spoke for a minute or so, pointing out that the Crown had neglected to mention some key facts: the Obstructing Justice charges; and the fact that the Deputy Minister had her fingers in the pie along with Fantino’s. He also pointed out that the pre-trial judge warned the Crown not to bring the case to trial. …but the media weren’t buying pork today. The idea that the Crown had a chance of convicting McHale after two senior officers associated with his case were charged with Obstructing Justice (never mind the direct interference by Fantino, and possibly, the DM) was nothing short of laughable. I overheard Christie Blatchford on her phone talking about the charge, presumably with her editor, saying, “…yeah, the charge they made up.” It was rather amusing. There is was, in lawyer David Feliciant’s opening statement yesterday, a glimpse of the dark heart of the government case. Mr. Feliciant was attempting to put lipstick on the pig of the defence case in the civil trial that started here this week before Ontario Superior Court Justice Thomas Bielby. To borrow a phrase from Blatchford, today’s government lawyer (who only recently inherited the case in late 2009) was reduced to putting lipstick on a pig — and the porcine attributes of his silly statement were plainly visible to all. The CHTV piece suggests they weren’t fooled by the lipstick either. The Crown should have accepted the pre-trial judge’s advice to put their turkey of a case on the dinner plate instead of chasing it around the barn until it died of old age. After sharing a lunch with Merlyn Kinrade and Jeff Parkinson, we went over to the dilapidated, trash-strewn entrance to the occupied Douglas Creek Estates – where McHale has not been allowed to go for more than two years – and took some photos. 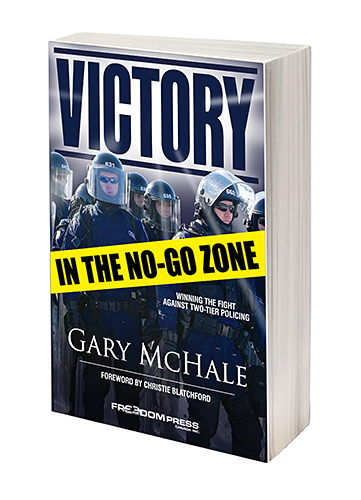 McHale is planning a ‘Victory’ rally once he and I return from our speaking engagement at Mount Royal University on May 05/10. 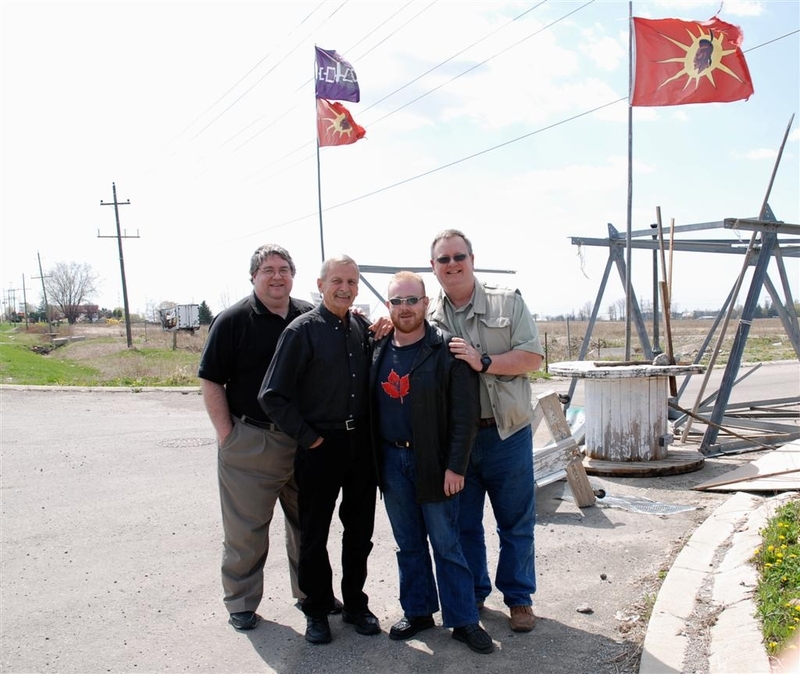 Photo 1: (L to R) – Gary McHale, Merlyn Kinrade, Jeff Parkinson, Mark Vandermaas, photo by CANACE, April 21/10. Photo 2: Occupiers’ threat to impose toll charges on public road, photo by Mark Vandermaas, April 21/10. Photo 3: Gary & Christine McHale, photo by Mark Vandermaas, April 21/10. 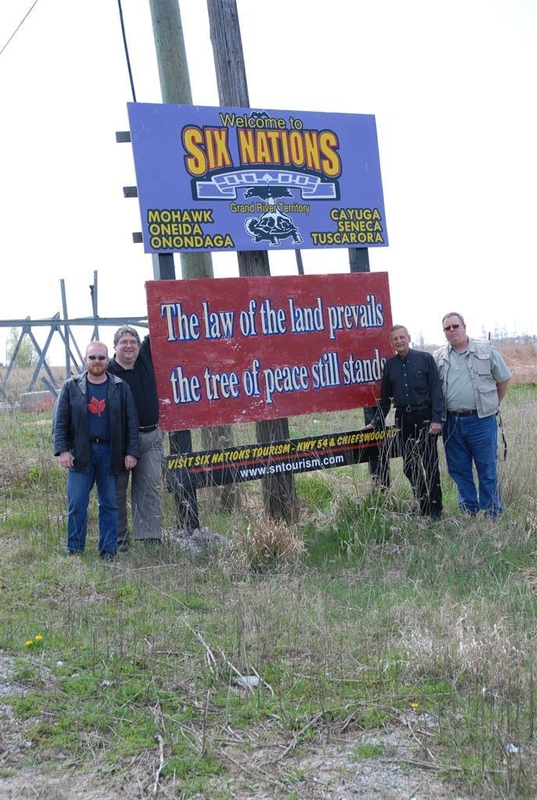 Photo 4 (Six Nations sign): (L to R) – Jeff Parkinson, Gary McHale, Merlyn Kinrade, Mark Vandermaas, photo by CANACE, April 21/10. 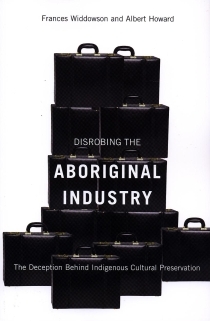 This particular chapter in the struggle against racial policing cannot be closed without commenting on the remarkable accomplishments of an ordinary schlub with a reading & writing disability; with no lawyer and no law degree; wearing the best shoes he could afford — his running shoes; taking on the best and brightest legal minds employed by the Ontario government (one of whom is now a judge) and turning the unjust charge against him into a stunning victory for all of us. McHale could have simply taken the easy road and pleaded guilty, but he refused to play their game. Instead, he forced Julian Fantino and other officers to play his game — of exposing their outrageous manipulations of the justice system. McHale called the Mayor of Haldimand to testify about racial policing. He forced Fantino to take the stand. 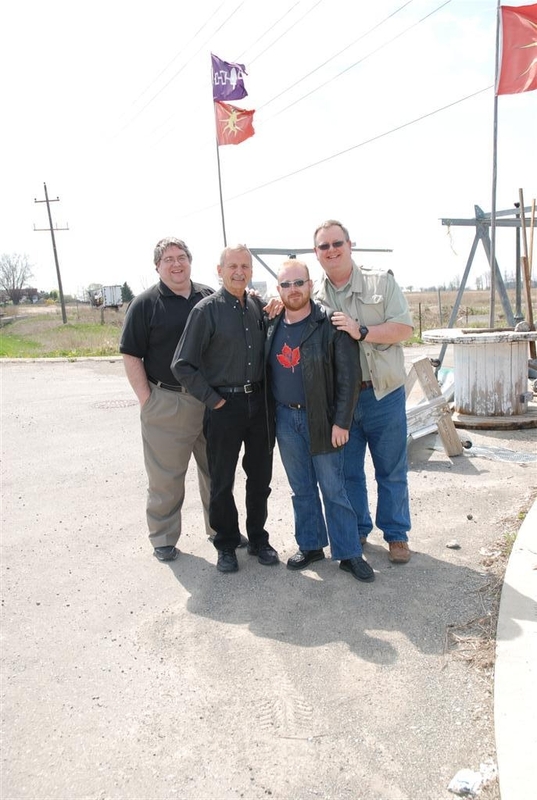 He called other police officers to testify, as well, including Hamilton Police officer Dave Hartless (also a Caledonia resident, and himself a target of the OPP/Ont gov’t) who said there was no policing in his town, and he called a heroic OPP officer named Jeffrey Bird who became the very first to confirm, under oath, the existence of race-based policing in Haldimand County. 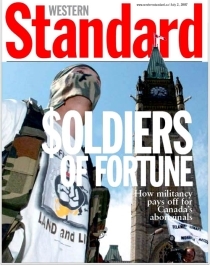 In the end, two of Fantino’s senior officers were themselves charged, and more OPP officers may face similar action. All of Ontario, all of Canada, really, owes Gary McHale a big ‘Thank you!’ for standing up to the OPP’s attempt to subvert the Canadian Constitution in order to silence a vocal and effective critic. NOTE: On Dec 01/07 front line officers were sending information up the chain of command that reflected the reality that the protest had been organized and led by Caledonia resident Doug Fleming, and the violence and criminal acts were being committed by native smokeshack supporters, but the message flowing downward from Fantino was that it was McHale’s protest, that McHale was responsible for the violence and mayhem in Caledonia, and officers needed to target him so the force could obtain travel restrictions that would keep him out of town. 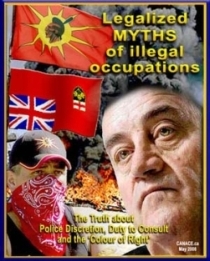 Instead of simply allowing his officers to conduct an investigation Fantino and his brass eagerly jumped on a false report that McHale might have assaulted a native woman and immediately set to work blaming him and his supporters for the day’s violence – even though the non-natives were actually the victims of multiple, unprovoked assaults. This entry was posted in 1. VoC's MOST IMPORTANT POST, 2. 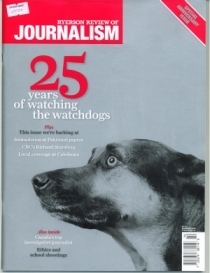 VoC's Favorite Post, Caledonia - Dec 01/07, CANACE, CANACE News, Christie Blatchford, Courage & Sacrifice, Fantino v Truth, Leadership, Legal actions & rulings, McHale Trial, Merlyn Kinrade, MUST SEE, Native Protests - Caledonia, One Law for All!, OPP Ron Gentle, Photos, Racial Justice, Racial Policing. Bookmark the permalink. Congrats to Gary and a big thank you from a Caledonia resident. Yesterday’s victory for justice shows that ordinary people CAN change things if they simply fight back using our democratic processes. 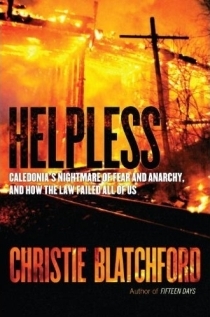 The attention of Christie Blatchford on Caledonia shows that the the truth WILL be told. Judges ARE listening and they ARE rejecting the idea that non-native people are expendable. Moreover, I believe that the good people of Six Nations are also rejecting the thuggery of the criminals in their midst and the terrible shadow it casts over their community. We are closer to the day when we can finally have true partners for peace, healing and reconciliation from Six Nations who understand their responsibility to apologize for what they allowed to take place on their watch. 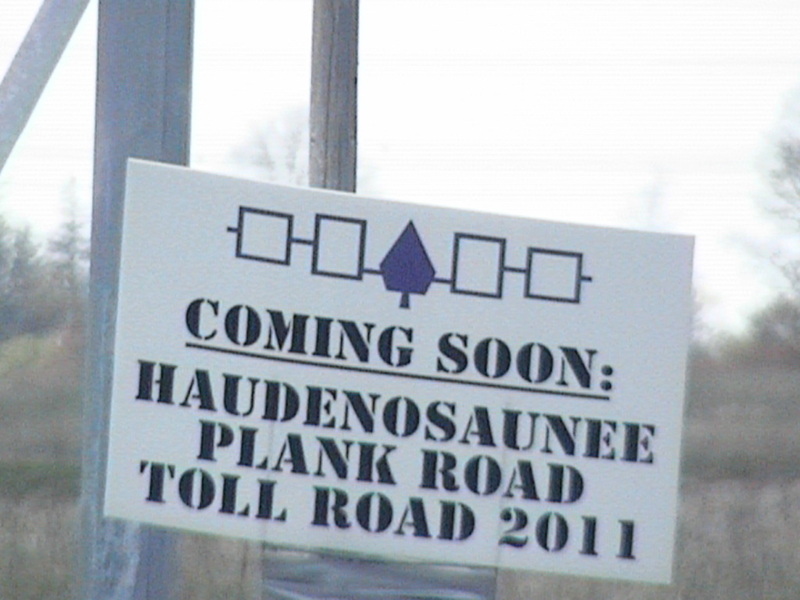 The OPP and provincial government must do the same. It may take 5 years, or even 10, but that is what must happen before this is over. Gary’s victory has taken us another step towards that day. Thanks so much for writing Donna. Regards, Mark. Congratulations to Gary for having the courage and tenacity to fight for what he believes is right against formidable odds. I am not familiar enough with the Caledonia situation to have an opinion. However, the reported apparent reluctance by the OPP to be hampered by having supporting evidence before laying serious criminal charges that can ruin reputations and destroy lives is obviously very wrong. Investigative Reporter,Christie Blatchford, of the Globe & Mail is also to be commended for continual fair and balanced reporting. It is to be hoped that she will keep the public informed as this story continues. VoC REPLY: Christie deserves so much credit for her willingness to dig deep (VERY deep) into the Caledonia crisis. She is the first to do so. The CBC did a bit, but Christie is going all the way to the bottom, and she is shocked by what she sees. The other reports listed in the right side margin are pretty good, too. Thanks for writing. Mark. Gary is in an even bigger fight than most people are aware of, that is: Our country is based on racial policies, procedures and laws. Our politicians over the years (both parties) have been on a steady path towards complete segregation of the races. Native Schools, Black Schools, Distinct Societies, OPP Framework, Human Rights Commission, Special courts, taxes….. All these structural privileges create resentment among the masses who thought they were all equal under one government and one set of laws. This resentment is cloaked by the benefactors of such policies who simply claim RACISM. A chilling effect results and all debate comes to a crashing halt. “All animals are created equal, but some are more equal than others”. George Orwell ‘Animal Farm’. 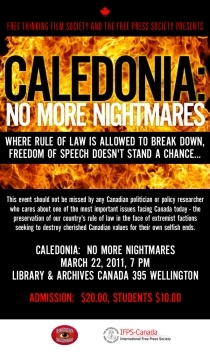 Canada is not free, free speech does not exist. 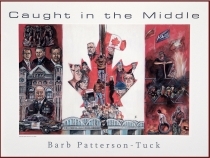 VoC REPLY: You are so right; we are in a big fight to turn back politically-correct racism in Canada. 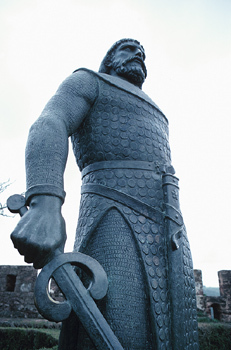 We recently saw just how ugly it really is when the Mac student (former CUPE officer) commented on a CANACE anti-racism event by saying – essentially – that because Caledonians are mainly white, they deserved what happened to them at the hands of native thugs. 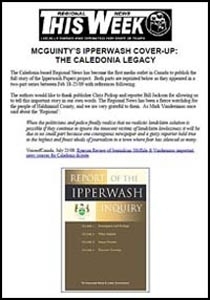 We were certainly aware of the ‘white privilege’ doctrine in support of the crimes against Caledonia, but her article in the Spec is the first time it has been forced out into the open – in all its disgusting evil. 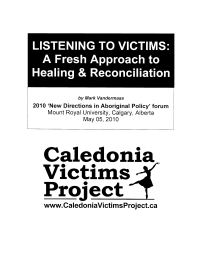 Those who would deny Caledonia victims protection and their place in history because of the colour of their skin vs. the colour of their victimizers are desperate to stop this growing movement to expose their repugnant, racial supremacist attitudes. 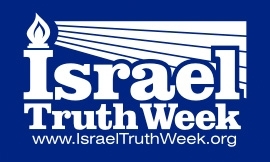 In my opinion, ‘white privilege’ is uncannily close to Nazi doctrine of assigning group guilt to a race of people in order to deny them their rights, and justify outrageous crimes against them and theft of their property. Wish I had more time to comment further; I do have an article in progress on this that I haven’t had time to finish. For now, let’s try to remember Gary’s message all along that we must stand the test of time and never give up. This is a fight we cannot lose and will not lose. The media is finally catching on. Academia is catching on. Even (believe it not) the OPP is catching on to the fact that we will not be ignored; we will not allow them or their favourite criminals to subjugate us; we will not be cowed; we will not be silent; and we will fight back. Good things are happening. Gary knew it would take years of tiny steps to make it happen, and he was absolutely right. Somehow, all those tiny steps turn into big ones. Thanks for writing Twister! Good to hear from you again. Mark.